With flu season upon us, I made a big batch of my homemade lemon chicken noodle soup and it was good for the soul (ha - I had to!). I make my own noodles because they are 1000 times better than store-bought and, while they're not exactly "quick", I do think they're really easy and the process is actually super enjoyable. Maybe I have problems but I love me some comfort food! I also add bay leaves because according to my friend's Jewish grandmother, bay leaves cure a cold! Oh, and lots of lemon too, cause hello - vitamins and freshness! Combine chicken broth and chicken in a heavy, large pot. Bring to boil. Reduce heat and cover partially and simmer until chicken is cooked through, about 20 minutes. Using tongs, transfer chicken to a large bowl. Cool chicken and broth slightly. Discard skin and bones from chicken. Cut chicken meat into bite-size pieces and reserve. Spoon fat off top of chicken broth. Whisk together the flour and salt. Make a well in the center and add the egg yolks, eggs, and milk. Using a fork, start lightly blending the mixture until it is evenly moistened and looks pebbly (kind of like scrambled eggs.) Drizzle water, about 1 tablespoon at a time, over the mixture and mix until it starts to come together in a ball (you’ll have to use your hands at some point.) Keep mixing until all the flour has been incorporated but it’s not overly sticky. You can also use a stand mixer for this part and save yourself a whole lotta trouble... I know I do. Sprinkle about 1/4 cup of flour on a clean work surface, having more flour handy if necessary. Roll half of the dough out onto the work surface, flouring everything along the way (your hands, rolling pin, additional flour for the work surface, etc.) Roll the dough until it is paper thin, about 1/16″. Using a pizza wheel, cut the dough into strips (anywhere from skinny to very wide - I do mine about 1/4" wide). Return broth to a simmer and add onion, carrots, celery and bay leaves. Simmer until vegetables soften, about 8 minutes. Stir in lemon juice, noodles, reserved chicken, frozen peas and chopped parsley. Simmer until noodles are tender, about 5 minutes. Season with salt and pepper and serve. Hi Lizzy! 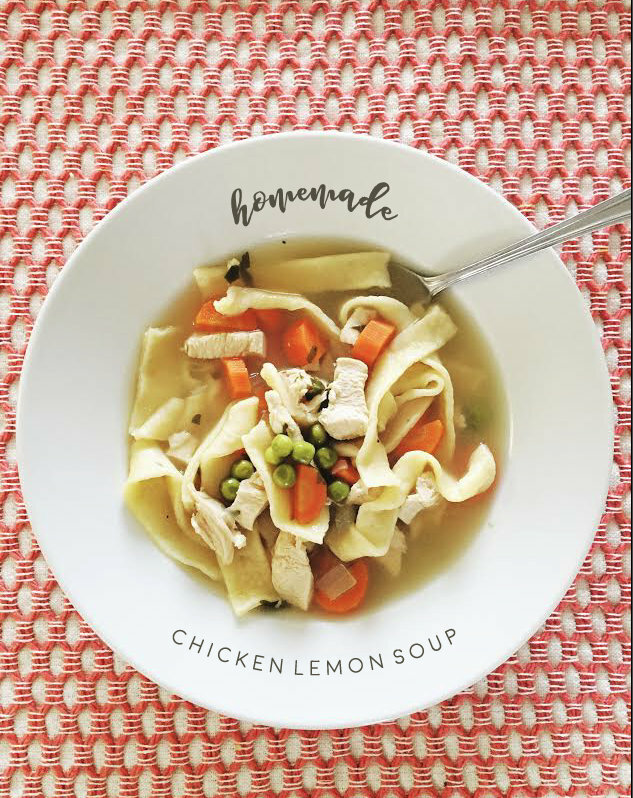 What chicken broth is your favorite? Do you make your own? Thanks! I do make my own and it is soooo much better! If you buy some though, I suggest low sodium so you can control the salt. Is the lemon juice very strong? Or does it just brighten things up? It's not too strong, and I think it makes it taste so fresh! But if you prefer, you could do half a lemon and add more if you want after tasting.